Chinese meals can contain as much salt as five Big Macs – close to toxic levels, warns new research. They should carry a health warning for raising the risk of heart attacks and strokes, claim health campaigners. Supermarket Chinese ready meals are also packed with salt – with some containing more than two store-bought Pizza Express Margheritas, according to the study. Iceland’s Takeaway Egg Fried Rice has a shocking 4.1g salt per 350g pack – more than 11 bags of ready salted crisps. 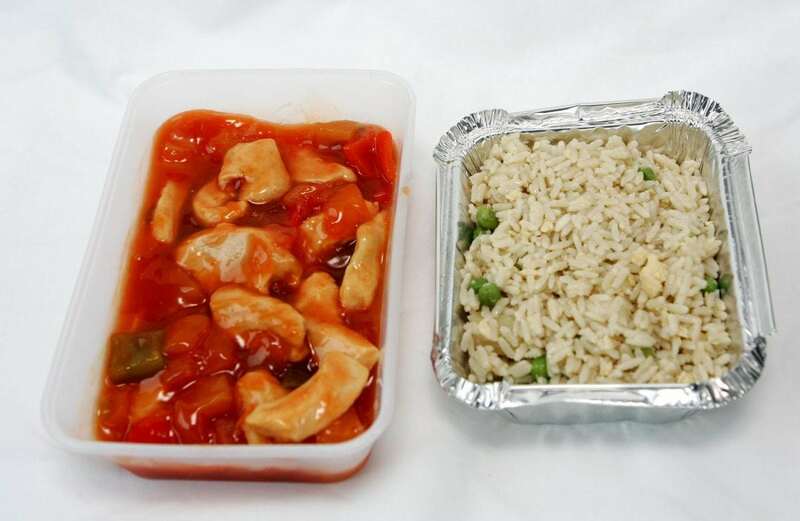 The saltiest Chinese ready meal was Slimming World’s Chinese Style Banquet Rice with 4.40g salt per 550g pack – that’s more salt than two store-bought Pizza Express Margheritas. Next in line was Marks & Spencer Crispy Sweet and Sour Chicken Banquet with 4.13g salt per 500g pack. scoffing more than three McDonald’s hamburgers. When it comes to dipping in soy sauces were by far the saltiest – on average being over five times saltier than seawater. nearly 4g salt per person alone. For example, 2 ASDA Hoisin Duck Spring Rolls and 15ml of ASDA Dark Soy Sauce contains 3.82g salt – more salt than nine servings of peanuts. Of the 141 supermarket ready meals surveyed by Action on Salt – formerly CASH – nearly half (43%) had 1.8g per portion – enough for a red label on the pack. Sarah Alderton, Assistant Nutritionist at Action on Salt, said: “Considering how many millions of takeaways and ready meals are eaten in the UK each week, the food industry must be held to account, with new salt targets set by the government to ensure the salt content of these meals is reduced to much lower levels, and fast. To mark Salt Awareness Week the report is calling on Public Health England to set new salt targets, make front of pack labelling mandatory. It also wants it to follow the lead of the New York City Board of Health by ordering chain restaurants to put warning labels on high salt dishes. Every 1g reduction in salt intake prevents 7,000 deaths, 4,000 of which are premature, from strokes and heart disease. With 22 million takeaways eaten by UK adults each week – Chinese being the most popular – there’s an urgent demand to drastically cut salt content, they said. An analysis of Chinese takeaway meals purchased from six independent restaurants in London’s famous Chinatown revealed 97% contained a hefty 2g of salt or more per dish. Over half (58%) contained more than 3g of salt per dish – which is half an adult’s maximum recommended daily intake in one portion alone. Combining side dishes would take diners over the top – for the whole day. The saltiest main with a rice/noodle side dish contained a staggering 11.50g salt (Beef in Black Bean Sauce and Vegetable Noodles from Wong Kei restaurant). This is the equivalent of five Big Macs – and getting near to acute toxic levels. There were large variations in the salt content of the same dishes from different restaurants. The saltiest sweet and sour dish contained a staggering 3.4g per dish – that’s the same amount found in 70 Ritz Crackers. The lowest had just 1g. Beef in black bean sauce dishes were the saltiest on average (1.27g/100g), whilst sweet and sour dishes were the least (0.54g/100g). last set of targets due to be met by the end of 2017 have been reached. premature – from strokes and heart disease. Sonia Pombo, campaign manager at Action on Salt, said: “Our data shows food can be easily reformulated with lower levels of salt, so why haven’t all companies acted responsibly? “The lack of front-of- pack colour coded labelling on branded products makes it incredibly difficult for consumers to make healthier choices and that is simply unacceptable. Professor Graham MacGregor, of Queen Mary University, London, and Chairman of Action on Salt, added: “Salt is the forgotten killer as it puts up our blood pressure, leading to tens of thousands of unnecessary strokes, heart failure and heart attacks every year.